Before installing any DriveWorks Pro module please ensure the prerequisites have been met on the machine the module is to be installed on. During installation an internet connection is required to download and verify the root certificates that ensure the software you are installing is genuine and trusted. We recommend temporarily disabling any Anti-Virus software before installing DriveWorks. DriveWorks customers with a Subscription Support contract can download the latest software from the DriveWorks Customer Portal. If you do not have access to the portal and do have an active Subscription Support contract please send an email to info@driveworks.co.uk. 1. Decide on which machine the module will be installed. The most typical scenario would have each DriveWorks application on a separate machine, with a separate file server and a separate SQL Server. Model Generation - Requires SOLIDWORKS to be installed on the same machine. To balance the loading of the Autopilot machine these functions can be split over several machines. In this instance separate licenses of Autopilot are required. Database Server, DriveWorks Pro Server If using network licenses the DriveWorks License Manager can also be located here. File Server All DriveWorks project data is located here. All new data generated by Autopilot is located here. 2. Check each machine meets the Prerequisites for the module to be installed. 3. Check how is the module to be licensed. If the module being installed is a Network License (also referred to as a floating license) you will need to install the DriveWorks License Manager on a machine that will be the license server. You can determine the license type from the activation code issued to you. Please see the topic Info: Identifying Activation Codes for more information. Please refer to the section Network License in the topic Licensing to familiarize yourself with the process. If the module is a Fixed License activation is done on the machine the module is being installed on. Ideally internet access is required to activate but there is also a manual process if this is not possible. Once each of the above checks have been made installation can begin. 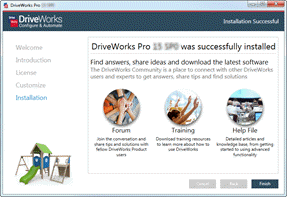 The section Installation at the bottom of this page will show you the steps required to install the required DriveWorks Pro module. Once installed the module can be launched on the machine it was installed on and licensed (if required). Please see the topic Licensing for information on how to license the module. To allow multiple DriveWorks Pro modules to connect to the group that has been created it is required to be a shared group. Please see the article Group Upscale for information on up-scaling an individual group to a shared group. Go to your DriveWorks Administrator machine and launch DriveWorks Administrator. From the DriveWorks Today stage locate the required group under the recent heading of the main window. If your implementation has been held locally on the machine DriveWorks Administrator is installed on it will need to be moved to a network location so all modules can access it. Please refer to the topic How To: Move DriveWorks Data for information on how to do this. However if your implementation was already stored on a network location you just need to make sure each machine requiring access to the DriveWorks files can see the same location as the DriveWorks Administrator machine. If you are using UNC paths to access the network files this should be straightforward. If you used mapped network drives to access the network files the same drive letters must be mapped on each machine the DriveWorks module is installed on. Please expand the sections below for information on installation alongside previous versions of DriveWorks modules. The chart below lists which DriveWorks Pro modules can be installed alongside previous Major Versions of DriveWorks. Administrator Can be installed alongside any earlier major version (must be a supported version). User Can be installed alongside any earlier major version (must be a supported version). Autopilot Can be installed alongside any earlier major version (must be a supported version). Live Can be installed alongside any earlier major version (must be a supported version). Pro Server v10 SP2.1 (or previous service packs) cannot be installed alongside any newer version. If there is a need to continue to run Pro Server v10 SP2.1 (or previous service packs) this must be installed on a different machine. Pro Server v10 SP3 or newer can be installed alongside any future version of DriveWorks Pro Server. DriveWorks Pro Server provides an option to upgrade groups created in earlier versions. This topic refers to Microsoft SQL Server, please refer to the DriveWorks Pro Server Prerequisites for information on which editions of SQL Server are supported. License Manager Different versions (major or service) cannot be installed together. 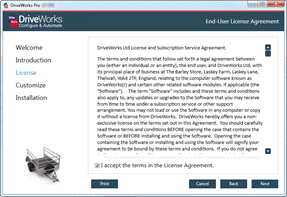 DriveWorks License Manager will manage the licenses for earlier versions of DriveWorks. Please follow the instructions below before installing your new Service Pack. Please uninstall the previous Service Pack of the version being upgraded before installing the new service pack. When more than one module of DriveWorks Pro is in use the service pack number of each module must be identical. This includes the DriveWorks Pro Server module. DriveWorks Solo and DriveWorks Pro can be installed on the same machine as long as their major versions and service packs match. If you are running an older version, please upgrade DriveWorks Solo before installing DriveWorks Pro. To find the version of DriveWorks Solo you are currently running please click here (internet connection required) and follow the instructions. Previous major versions of DriveWorks Solo cannot be installed alongside the current major version of DriveWorks Solo or DriveWorks Pro. Please expand the sections below for information on the installation files and process. 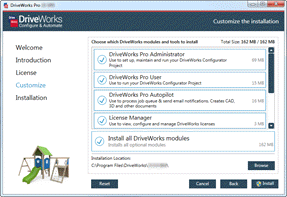 All DriveWorks Pro modules are installed from a single installation file. Installation from a downloaded file will require the appropriate file to be double clicked to start the installation. Silently - If there are no License terms to accept. Integrated into the DriveWorks installer - If there are License terms to accept. Once downloaded, double click the installation file on the machine the DriveWorks product is to be installed on to start the installation process. If the installation detects Microsoft.NET Framework is required click Accept and Install. Clicking Decline will terminate the installation process. Once the Welcome dialog appears click Next to begin the setup. 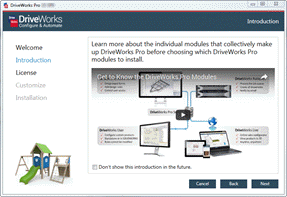 Play the video to understand more about the DriveWorks Pro modules that can be installed. Click "I accept the terms in the License Agreement", and click Next to continue. Select the DriveWorks product(s) that are required to be installed. Click Browse to change the installation location (if the default location is not acceptable). The installation will begin with feedback on the progress. When complete click Finish to close the installer. DriveWorks can also be installed by using the command prompt. 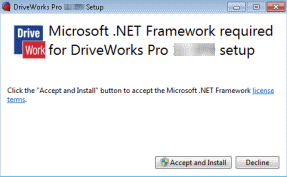 Please see How To Install DriveWorks From A Command Prompt for more information. 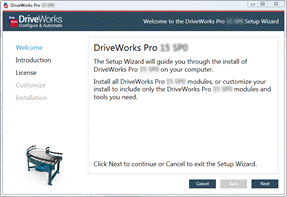 Repairing or Removing DriveWorks Pro Modules from the Installation. Repairing or removing individual modules after installation requires the use of the installation files extracted to the C:\Users\ Currentuser\AppData\Local\Temp location. If this location has had its contents removed the original installation file will need to be extracted to continue the repair. If the installation file was downloaded we recommend saving the file to a backup location to ensure the installed application(s) can be repaired or modified in future. Double clicking the DriveWorks installation file has been known to launch the installer for another product. If the installation launches the install of another application please ensure this directory is empty and run the DriveWorksPro installation file again. Repairing or removing individual modules after installation requires the installation files extracted to the Temp location above. If the installation file was downloaded we recommend saving the file to a backup location to ensure the installed application(s) can be repaired or modified in future. Uninstalling the DriveWorks application will not remove any information for licenses that have been activated on the computer. To remove licensing information (For instance when the machine hosting the application is to be changed) please refer to the section To Return a License in the License Management topic. Before uninstalling DriveWorks Pro Server launch the application and stop the server service. The term Major Version refers to the product number of DriveWorks. The major version numbers that are currently supported can be found in the article Info: Supported Versions. Each major version of DriveWorks has periodic service pack releases. This is to ensure the software stays current with all updates applied to operating systems and other applications that DriveWorks integrates with. Service packs can also include new functionality, enhancements and bug fixes.